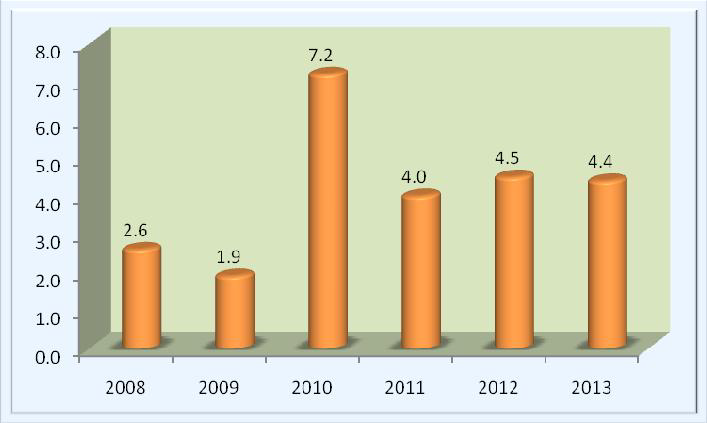 Kenya National Bureau of Statistics hereby releases Consumer Price Indices (CPI) and rates of inflation for December 2013. These numbers have been generated using data collected during the second and third weeks of the month under review. The prices were obtained from selected retail outlets in 25 data collection zones located in 13 urban centers. The CPI increased by 0.50 per cent from 143.14 in November 2013 to 143.85 in December 2013. The overall inflation rate stood at 7.15 per cent in December 2013. 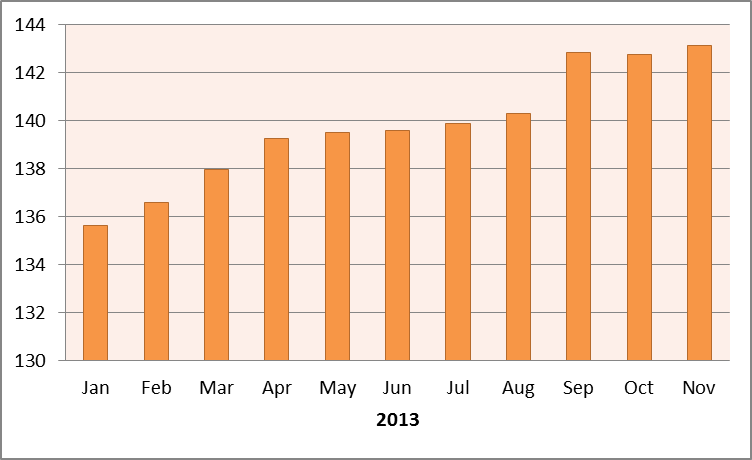 During the month of December 2013, Food and Non Alcoholic drinks’ Index increased by 0.55 per cent. This was observed as a net effect of increase in prices of some food items outweighing notable falls in others. Between November and December 2013, Housing, Water, Electricity, Gas and Other Fuels’ index, increased by 0.01 per cent. This Marginal increase was attributed to notable rises in the cost of cooking fuels. However, as can be seen from Table 3 above, a significant fall in the cost of electricity balanced the net effect in the index. Despite introduction of a Water Resource Management Authority (WARMA) levy of 6.0 cents per KWh electricity costs reduced significantly due to waiving of inflation levy and reduction of forex adjustment costs. Transport Index increased by 1.83 per cent over the review period, mainly due to higher matatu and bus fares associated with chrismas festivities. This was further compounded by marginal rises in petrol and diesel prices…Download..
Consumer Price Index (CPI) increased from 142.75 points in October 2013 to 143.14 points in November 2013. The overall rate of inflation declined from 7.76 per cent to 7.36 per cent during the period. The Kenyan shilling appreciated against the Euro, the Japanese Yen, and the South African Rand, exchanging at an average of KSh 116.21, KSh 86.21, and KSh 8.43, while depreciating against other major currencies, as at the end of November 2013. The average yield rate for the 91-day Treasury bills, which is a benchmark for the general trend of interest rates, increased from 9.58 per cent in September 2013 to 9.70 in October 2013. The inter-bank rates increased from 7.82 per cent to 10.60 per cent during the period. The Nairobi Securities Exchange share index (NSE 20) increased from 4,936 points in October 2013 to 5,101 points in November 2013, while the total number of shares traded decreased from 804 to 645 million shares during the same period. The total value of NSE shares traded declined from KSh 15.9 billion to KSh 13.1 billion. Broad money supply (M3), a key indicator for monetary policy formulation, increased from KSh 1,862.0 billion in September 2013 to 1,879.1 billion in October 2013. Money and Quasi-money (M2) expanded from KSh 1,593.4 billion to KSh 1,596.6 billion over the same period. Gross Foreign Exchange Reserves decreased from KSh 695.2 billion in September to KSh 671.3 billion in October 2013. Net Foreign Exchange Reserves decreased to KSh 366.4 billion over the same period. Provisional estimates of Gross Domestic Product (GDP) show that the country’s economy maintained a moderate growth of 4.4 per cent in the third quarter of 2013 compared to 4.5 per cent recorded during a similar quarter of 2012. The growth was mainly supported by improved performances in financial intermediation, transport and communication, wholesale and retail trade, manufacturing, construction and mining and quarrying activities. On the other hand, there was a slowdown in the growth of agriculture and forestry sector which impacted negatively on the economic performance. Activities of the hotels and restaurants rebounded though the growth remained relatively suppressed. Seasonally adjusted growth, which tracks performance in consecutive, quarters indicate that the third quarter 2013 grew by 1.6 per cent compared to a growth of 0.8 per cent in second quarter 2013. 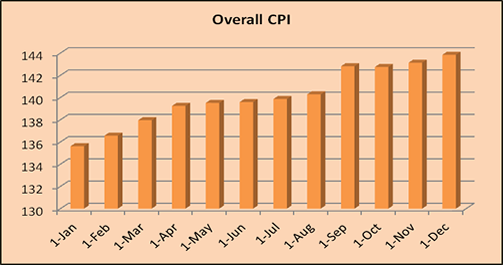 Kenya National Bureau of Statistics hereby releases Consumer Price Indices (CPI) and rates of inflation for November 2013. These numbers have been generated using data collected during the second and third weeks of the month under review. The prices were obtained from selected retail outlets in 25 data collection zones located in 13 urban centers. 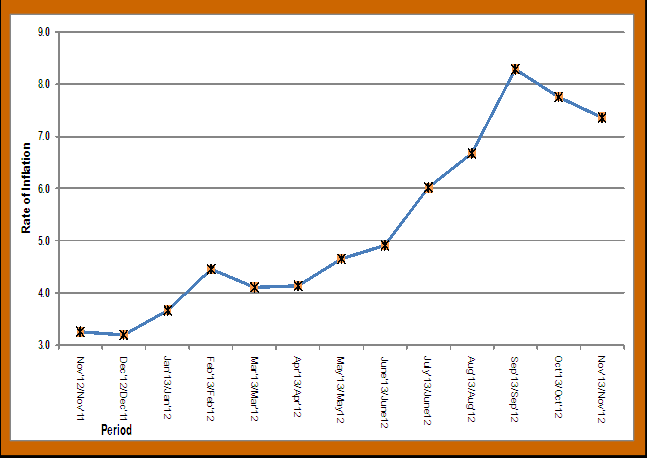 As shown in Tables 1 and 2, the CPI increased by 0.27 per cent from 142.75 in October 2013 to 143.14 in November 2013. The overall inflation rate stood at 7.36 per cent in November 2013. During the month of November 2013, Food and Non Alcoholic drinks’ Index increased by 0.40 per cent being a net effect of increase in prices of some food items outweighing falls in prices of others. Although the price of kerosene decreased by 2.55 per cent, over the review period, Housing, Water, Electricity, Gas and Other Fuels’ index, increased by 0.52 per cent. This was attributed to notable rises in the cost of some house rents, electricity and cooking gas as shown in Table 3. For instance, despite decrease in forex adjustment charges, fuel cost adjustment charges increased which led to slightly higher cost of electricity in November 2013 compared to October 2013. Transport Index dropped by 0.42 per cent mainly due to reduced prices of petrol and diesel..Read more..